Lexus has boldly managed to release its 2015 Lexus RC F vehicle and as things might prove, it is going to be a successful choice. The two-door coupe vehicle has become something that does not get to be released that often. We rarely see these kinds of cars made off recently as the market is mainly dominated by sedans, crossovers and SUV vehicles. This is why we are so excited that Lexus has decided to go out of the comfort zone and managed to produce this RC F car that makes us very interesting to know how the car will actually fair. Our predictions for the car, which you can notice from the tone of the review, is that the car is going to be a large success. We really feel that this is something that the market lacked and that it is a vehicle that is needed to freshen up things around here a bit. This high performance vehicle will have to fight with other monsters in the mostly German dominated field now but we feel this is a league where the RC F from Lexus might manage to fair well. The design and the way the car has been made is very interesting. Many car companies actually make the send first and later on downgrade it put cutting out two doors, and you are left with a two door coupe. But Lexus took things to a whole new level when they combined the concept of the design of three different cars in order to make one. The outcome of the project was the 2015 RC F and as seen from the provided pictures they did quite a bang out job of it. As we said the car has been made out of three different ones, so we may perhaps refer to the new 2015 Lexus RC F design as a real Frankenstein’s mashup. The chassis has been made by combing the Lexus GS sedan to create the part from the front bumper all the way to the A-pillars. Between the A-pillars and the C-pillars you will notice that the floorpan has been take from the Lexus IS C convertible version. And the end it all, the whole back end was adapted by taking out the design of the Lexus IS sedan vehicle. The whole thing has been welded together with structural adhesive systems and cowls, and with the additional help of some laser screw welding as well. The result of it all is a very aggressive look that has been even taken to the extreme. We get a pretty nice and good car that does not only perform fast but looks the part too. The wild styling combines a domed hood, unique fascia, a much deeper grille some flared fenders and enough cooling ducts. The idea looks great and the pictures are there to prove it. The designers of Lexus have really outdone themselves this time and need to get a medal for this idea. The interior of the Lexus RC F offers us a very cozy and snug cockpit with a center console that runs all along the whole central part of the car. Included is the bezel-shifting LCD gauge pod that has the ability to change the appearance depending on the drive mode, Eco, Normal, Sport or Sport+. Updated are some parts of the controls as well, as now you can use a simple rotary-knob control for the radio but haptic touchpad controls the infotainment screen. The front seat buckets have been highly bolstered and are capable of enduring 0.95 g. There are a lot of upgrades regarding comfort as well which has been enhanced through the use of very nice and appropriate materials. Great for the vehicle and much appreciated to get the design of the inside match the appearance and the performance of the car. The massive power and driving force that powers the Lexus RC F is the 5.0-liter V-8 which has been fitted in the Lexus IS as well, but this time it got a thorough overhaul for the RC F version. It enables it to go 467 horsepower but also adds some 200 pounds of extra weight that way. With this the car is heavier that tow tons and it may even increase with some other add ons that might be given to the car. But it can still speed up from 0 to 60 mph in just 4.4 seconds. 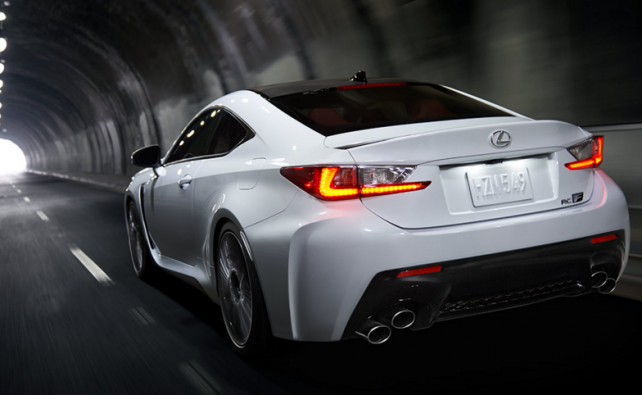 The new 2015 Lexus RC F is going to be released pretty soon and expectations rely for the beginning of next year. Till then you can wait with the knowledge that it will cost you some 63.000 dollars, which is the initial price of the car, and will leave you enough time to think about whether to buy it.